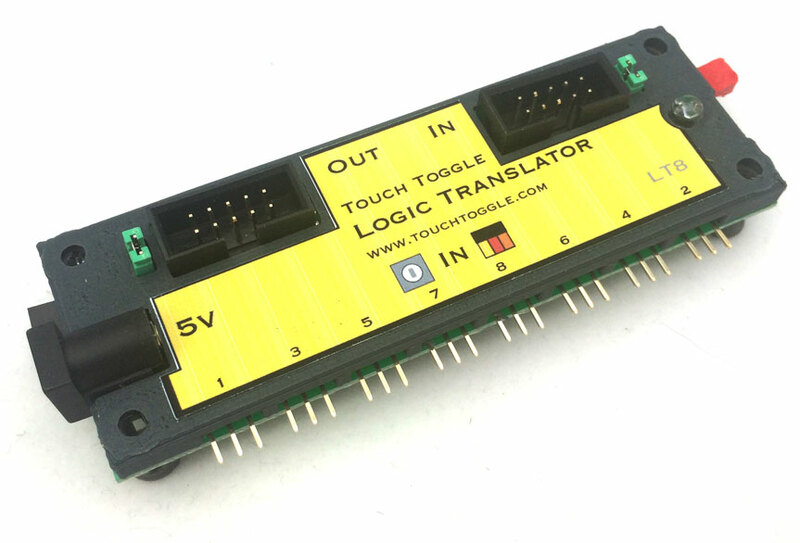 The Logic Translator lets you use Touch Toggles with networks and computer interfaces that use 5v logic. Touch Toggles can be used to send logic level signals to a computer input directly, but t’s bit more complicated to control a Toggle’s color. Our Logic Translator lets you use Touch Toggles to both send touch commands and receive the correct display color. Our Logic Translator has the same function as our Universal Translator, but accepts 5v common ground logic signals without all the buffering and opts-isolators of the Universal design. Our new Translators let the Touch Toggles control inputs to the controlling DCC or computer system, but still show the correct indication. Each touch sends out a momentary signal, and an “indication” signal back to the Translator tells it which display to show: HIGH for red, LOW for green. Like the Universal Translator, the Logic Translator DOES NOT understand DCC commands itself, but lets you use Touch Toggles or Mini-Cup Touch Toggles to drive control systems that accept momentary inputs. Removable jumpers make it trivial to isolate the +5v lead from either ribbon cable or both. Power may be drawn from the Logic Translator supply through either ribbon cable, or the Logic Translator may be powered from either attached device. Our Logic Translator requires power from a plug-in 5v power supply, or from either attached ribbon. It’s easy to isolate the 5v+ power in either ribbon cable just by removing a jumper. Logic Translators with a DC supply can be daisy-chained side-by-side to share power, with up to 32 Touch Toggles and 4 Translators in a row.